Exercise your dog with these Rebounce Balls. Contain natural recycled rubber. Chuckit! Rebounce Balls offer a great way to reduce your pet's carbon paw print. 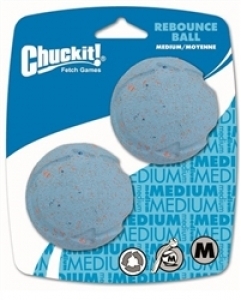 These durable rubber balls keep the game interesting and challenging for your dog. They're also made just the right size to use with your Chuckit! Medium Ball Launcher, sold separately.